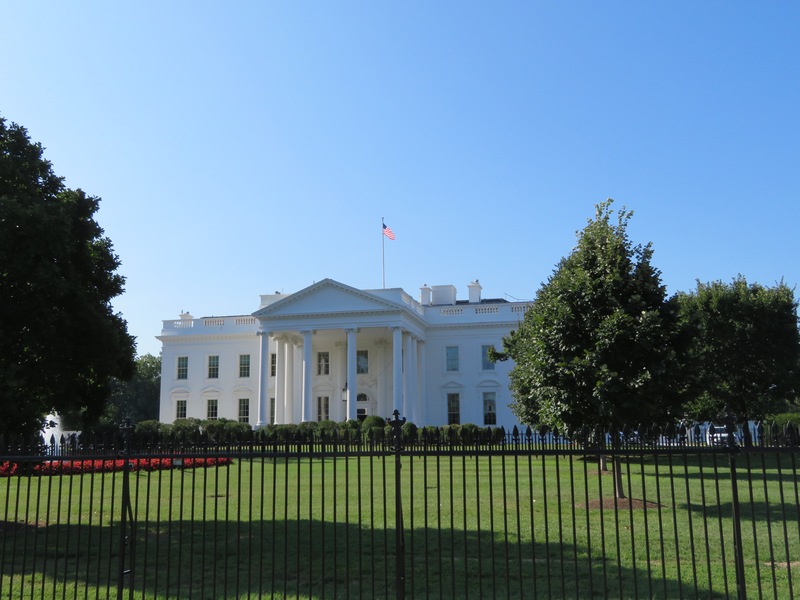 Where We’ve Travelled: Washington D.C. Unfortunately during this particular trip, we only got to spend one full day in Washington D.C. 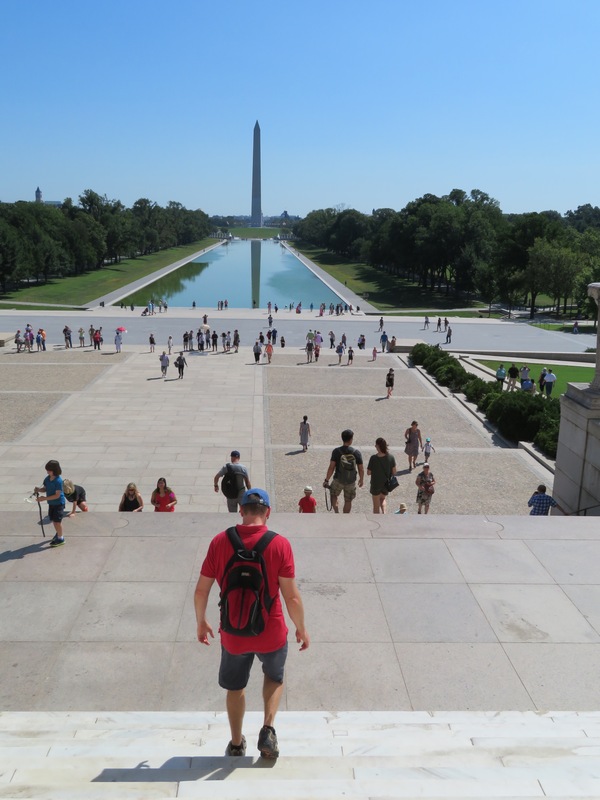 However, we packed a fair bit into that one day in the United States capital. We took the subway to the city from our friend’s house. I found the subway a little confusing to use, and I’m not sure why. In all of my travels over the world, I have used train and subway systems, many times when all of the signs were in another language. I have still been able to follow them enough to get me where I was going. For whatever reason, the Washington D.C. subway system stumped me. Fortunately, Poopsie was along for the ride and we made it in the end. Our first stop was The White House. Before we knew each other, we have both had the wonderful opportunity to have a tour inside the White House. However, we couldn’t come all the way to D.C. and not stop by. We took some photos from up against the fence and then took some further away, standing in Lafayette Square opposite. As we snapped away, suddenly some very stern looking Capitol Police began to clear the area. We got moved to the opposite end of the square so that we were now a few hundred metres from the White House. We could still see it, but it was a lot smaller in the distance. We waited for a little while, noticing the Secret Service agents on the roof who were obviously preparing for something. 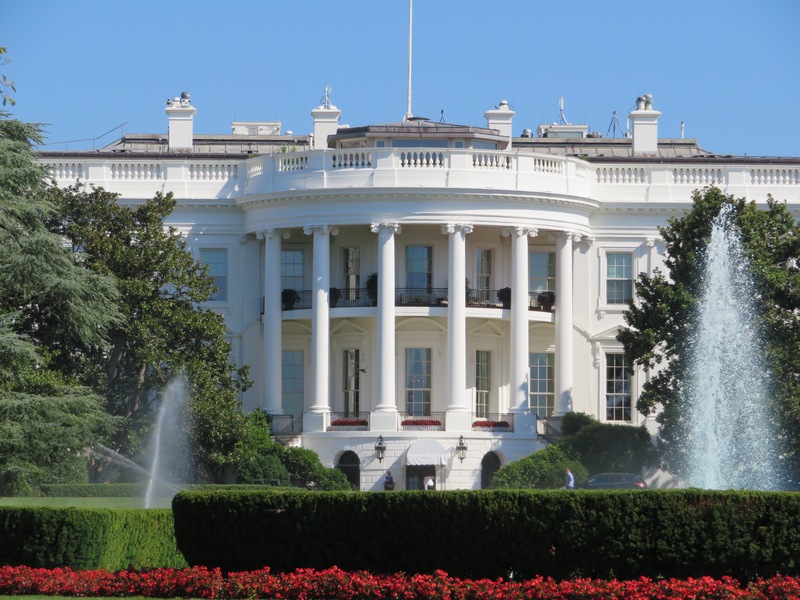 We decided to head around to the back of the White House, having to take a wide berth to avoid all the closed off areas. Everything looked just fine around the back. We snapped a few more photos and then made our way to the Washington Monument. On arriving there, we discovered it was possible to go up into the monument, but that you had to book weeks in advance. Had we known, we would have attempted to scale this magnificent tower. While we were checking it out, a helicopter which we think was Marine One flew away from the White House. This is obviously why we were cleared from the front. 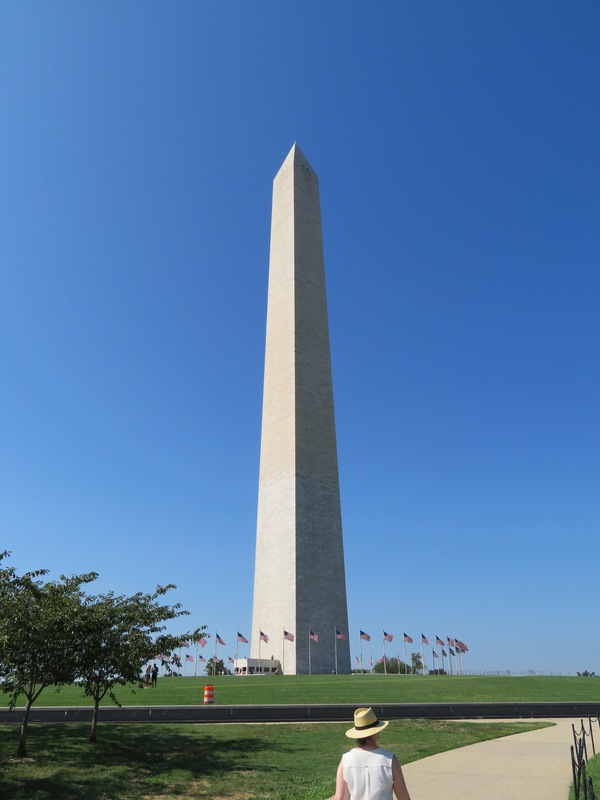 The Washington Monument stands at one end of a mall and down the other is the Lincoln Memorial. In between there are a number of other memorials, particularly ones commemorating the various wars America has been involved in. 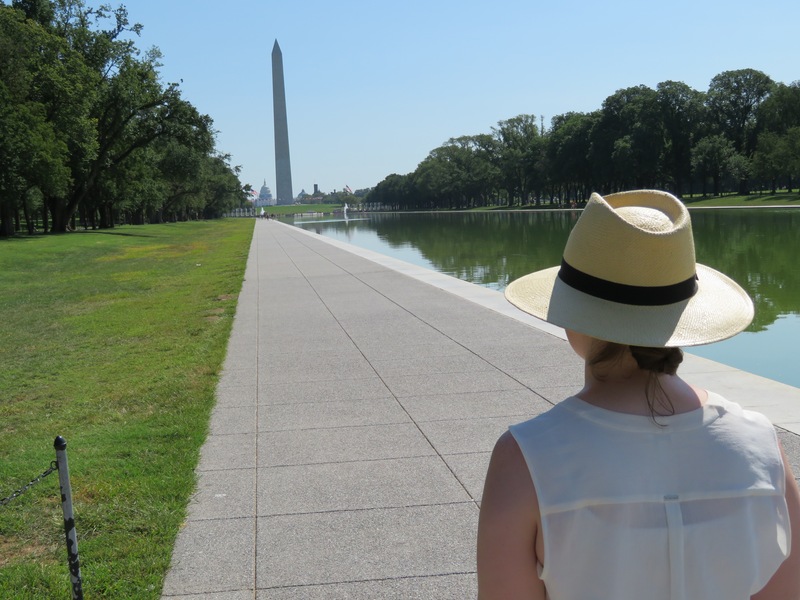 We spent a lovely morning making our way down the mall before we arrived at the Lincoln Memorial. The water was a bit yucky looking, but the beautiful day more than made up for it. 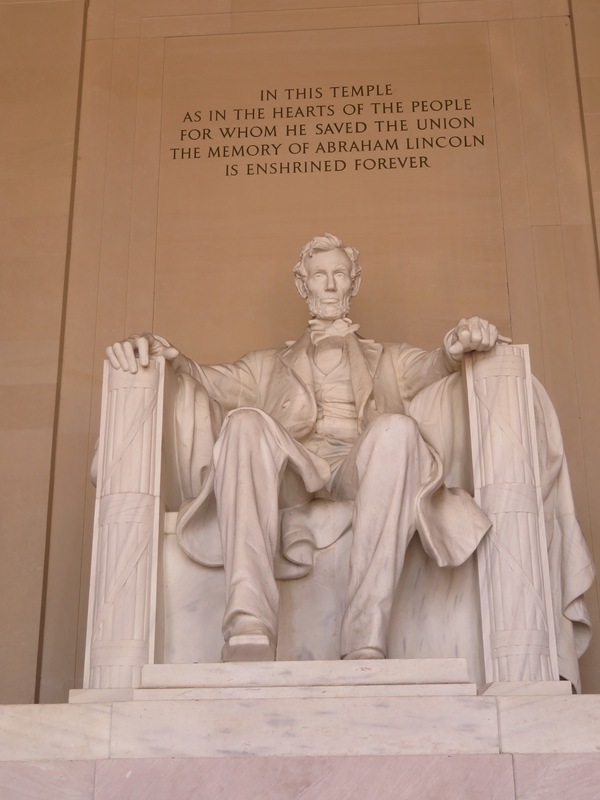 Lincoln’s Memorial is enormous. This was my third time to it and it still managed to take my breath away. The view back down the Mall toward the Washington Monument and proof that occasionally I do take a photo of Poopsie. Probably our favourite war memorial along the mall was the Korean War Memorial. It is very haunting, with each of the statues quite lifelike. 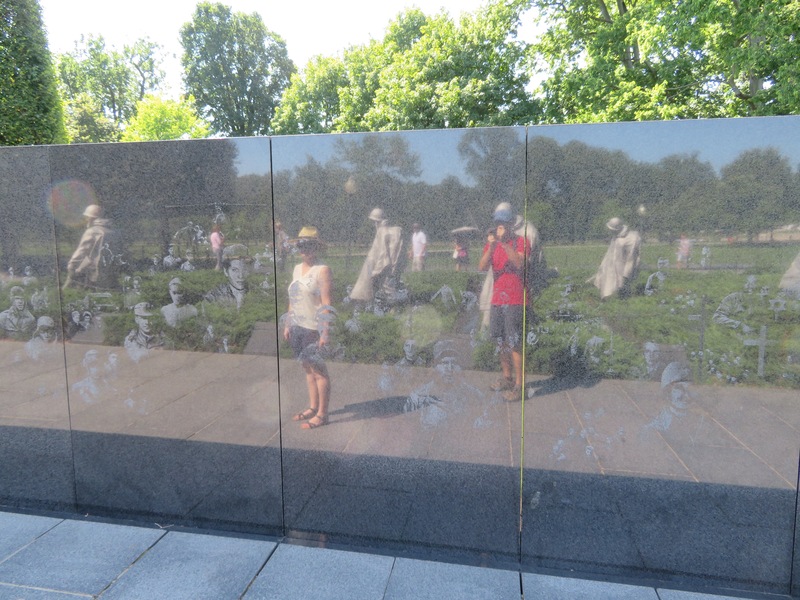 There is a highly polished granite wall that forms part of the memorial and as you can see from the photo below, it is easy to capture your reflection. 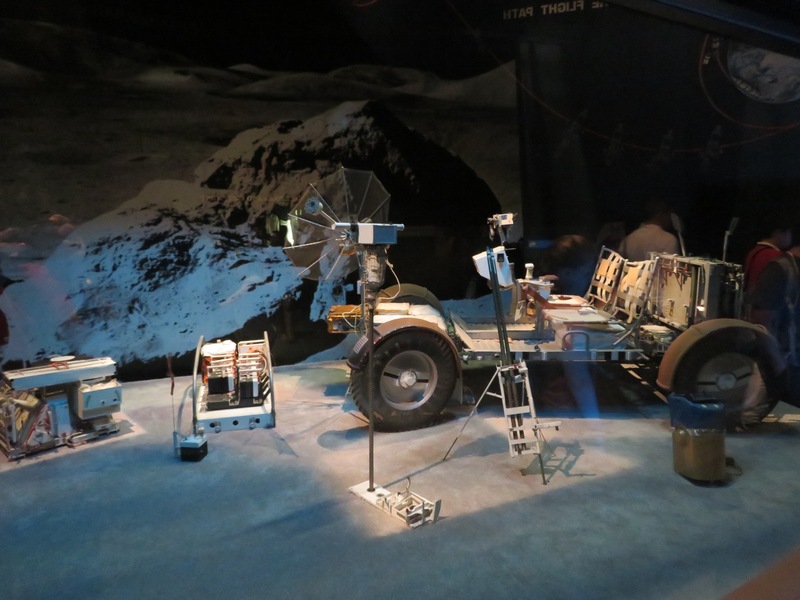 After checking out a couple more memorials, we began the half hour walk to a place I had been dreading the entire trip… The Air and Space Museum. Now, I would describe myself as a bit of a nerd. I read a lot and most of it is non-fiction. I am completely and utterly fascinated by space, particularly stars and planets. I enjoy learning about the brain and the human body. But despite this, I do not like the Air and Space Museum. I have been before, and was so bored I left after about 15 minutes. Poopsie is utterly appalled that I did this and honestly, it probably made him question our entire relationship. Poopsie, however, loves science. He is also quite interested in aviation and space. 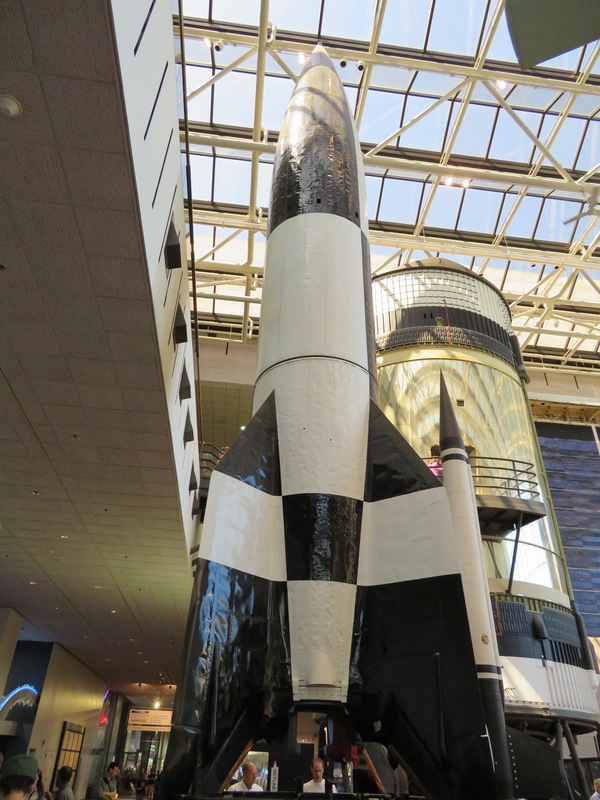 He was extremely excited about visiting the Air and Space Museum and no matter how much I tried, I could not get it removed from our itinerary. They run free tours of the museum, which we joined. Poopsie actually didn’t really like our tour guide, so we ended up leaving and rejoining the tour a number of times. I did my very best to approach the museum with open eyes, and I’ll admit, I did find a couple of interesting things along the way. Poopsie loved it and wanted to make sure I wrote that he recommends everyone spend at least half a day there if they’re ever in Washington D.C. I say, hit the highlights and you’ll be out of there in 20 minutes flat! I was in such a hurry to escape the Air and Space Museum, I almost took these stairs at a run. Our final stop was the National Gallery of Art. Poopsie and I both love art, as we have mentioned previously. We thoroughly enjoyed this one, including a Da Vinci that we previously had not been familiar with. You might notice that I haven’t mentioned any prices here… that’s because everything we did was free! 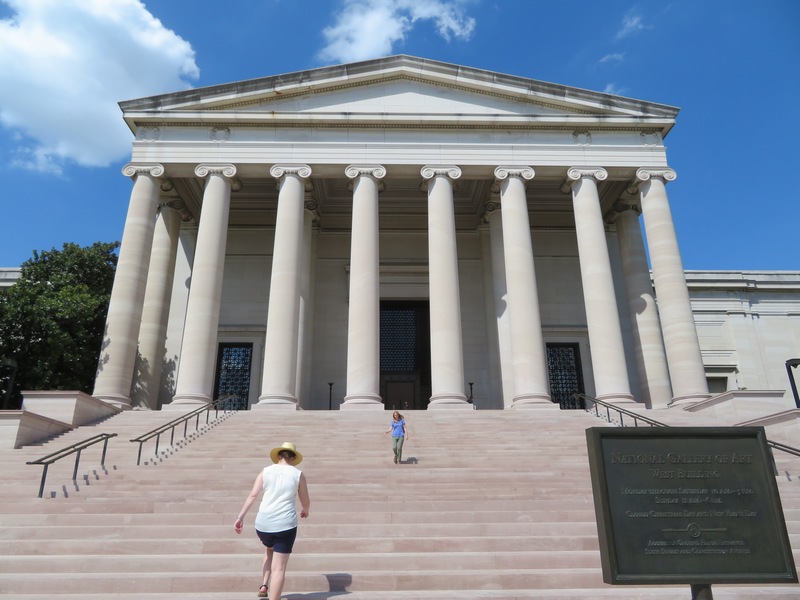 As with our own capital here in Australia, the sites, museums and galleries of Washington D.C. are free. We spent a few dollars on our train tickets and less than $15 on lunch. Everything else we did was free and we walked exclusively throughout the sites. This is a fantastic way to see a city and we try and walk whenever we’re visiting a new place. 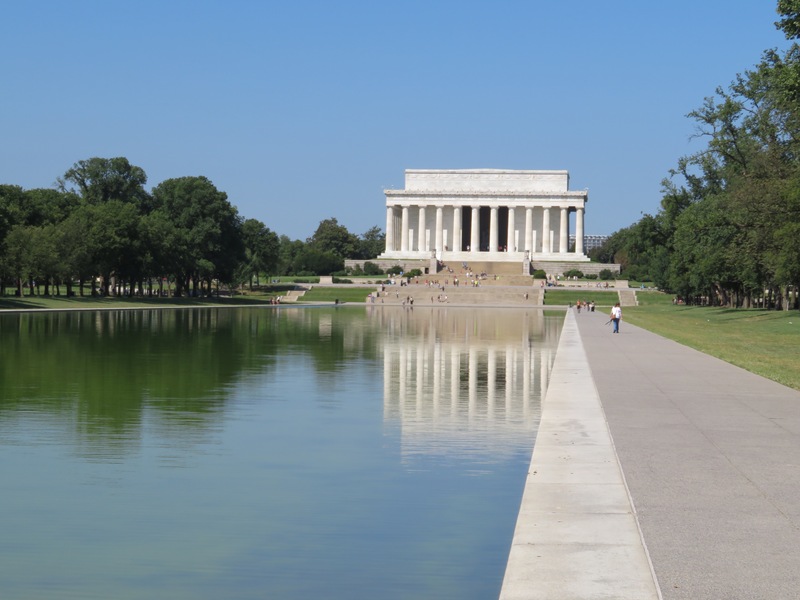 We definitely recommend Washington D.C. There was a great deal we didn’t get to in our one day, so we definitely think you need to visit for longer. We will keep Washington D.C. on our list as we want to make sure we get back and see everything else! 4 Responses to Where We’ve Travelled: Washington D.C.
You guys really managed to pack a lot into the day. All of the buildings are so white, clean and geometrical. Even in photographs they are impressive; I imagine in real life they would be awe-inspiring. You made me smile with your Air and Space Museum description, particularly that you tried hard to get it moved from the itinerary! I can’t say I noticed it at the time, but looking back, it was a very straight and clean place. We loved it- you’ll definitely have to head over!